← Another fun Dog Night in the Library! 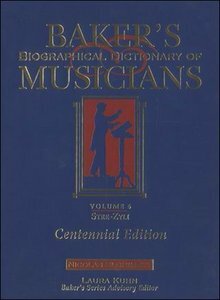 Theodore Baker, the 9th edition of Baker’s Biographical Dictionary of Musicians covers the medieval ages to the present. All musical genres are addressed, and the 9th edition is virtually a new book, with most of the entries rewritten, radically edited, and greatly expanded. Approximately 2, 300 biographies have been added, including not only contemporary figures, but also many neglected musicians of the past. From Beethoven to the Beastie Boys, Baker’s offers the most comprehensive and authoritative information on musicians.